It has been hovering around 100°F here in Minnesota for the past few days. This is what I consider August weather and I’m not accustomed to giving up my oven quite so early in the season, but alas, it is just too hot to turn it on. However, it didn’t stop me from making Monkey Bread. I just threw the pan of cinnamon sugar coated brioche in my crock pot and let it slowly “bake” until I had perfect Monkey Bread. We’ve been baking Five Minute Bread in a crock pot for years, thanks to a request from one of our readers. We were super skeptical at first, but were happily proven wrong and have been doing it ever since. It’s a brilliant way to avoid turning on the oven in the heat of summer, but it is equally useful at the holidays when the oven is in constant use and you still need to bake those holiday buns. Well, we’ve made our Master recipe in a crock pot, our brioche in a crock pot, dinner rolls, and even our gluten-free dough in the slow cooker. It seemed a good time to add to the list, and so we took on crock pot cinnamon rolls. 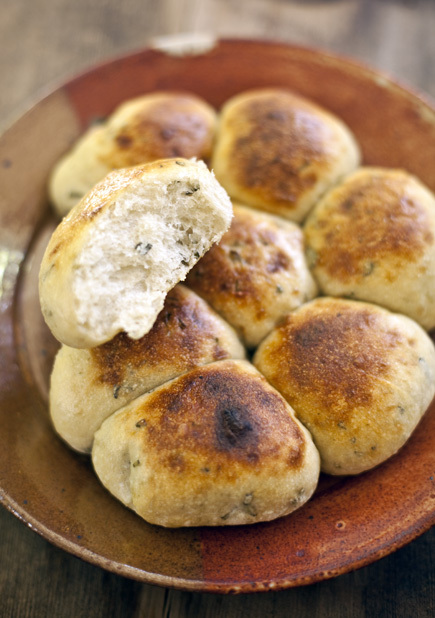 I’m happy to report that they work just as well; it’s as easy as rolling out dough, brushing some butter and sprinkling sugar, shaping rolls, and then letting them bake for an hour. My family couldn’t tell they weren’t baked in the oven, and my kids had the best after school snack of the year. 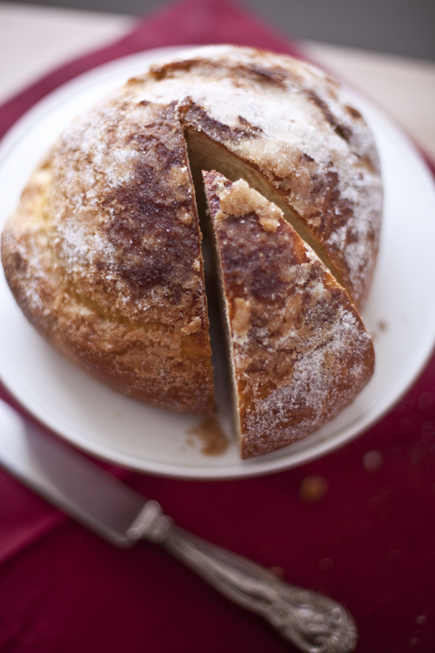 Sweet Brioche is the latest in my series of slow-cooker breads*. It may have taken me a while to give the old slow cooker a try, but now I am unstoppable. Some of you may know that I am in the very last stages of a kitchen remodel, which has me displaced and baking under less-than-ideal conditions. So, the crock pot is the perfect way to get the job done. It can travel from room to room and it takes up no space at all. This time of year we may not be concerned with heating up our house with the oven, in fact, I rather look forward to it. That is precisely why we northerners refer to winter as the “baking season,” because we do as much of it as possible to keep ourselves warm. But, this time of year can be a battle to find enough oven space. Thanksgiving and Christmas can pose a Rubik’s Cube style challenge of getting everything baked and on the table at the same time. 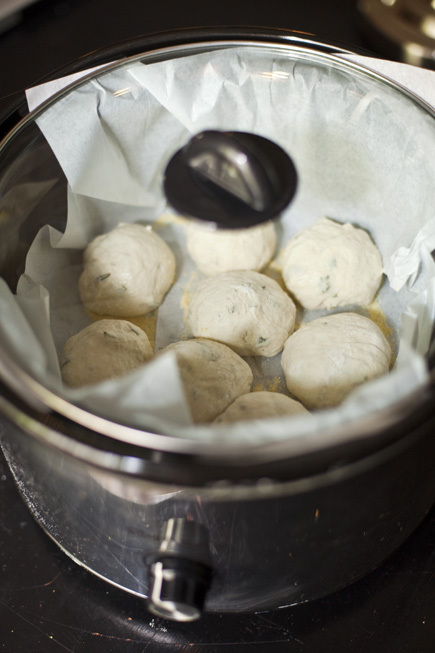 Why not eleviate some of the pressure by throwing a ball of dough in your crock? Next I have to see if I can make bread pudding in my slow cooker. 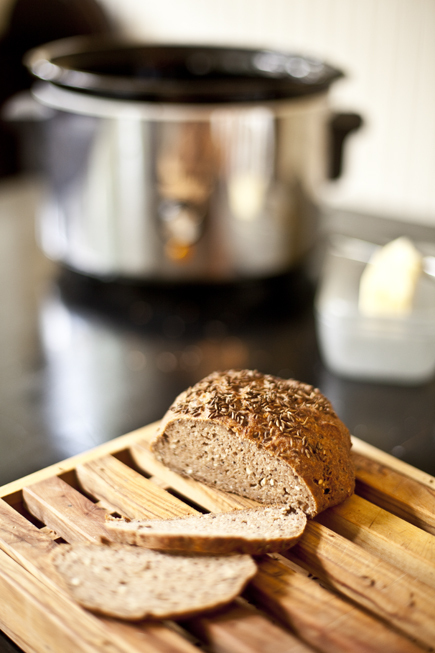 I do look forward to having my kitchen back, but until then I will not be without fresh baked bread.